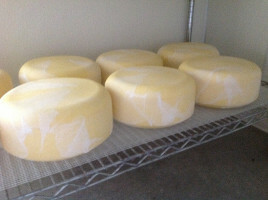 Jersey Gold is the epitome of a raw cow's milk cheese — smooth, creamy and full-flavored, even when young. A great all-around snacking cheese, Jersey Gold is also wonderful for melting. 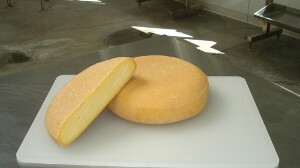 Our most popular cheese, Shenandoah Sunrise is our take on a southern French farmstead cheese. With age, the cheese becomes coarse textured and forms salt crystals much like Parmesan. With a savory start and a nice tangy finish, Shenandoah Sunrise is delicious paired with fresh fruit but is also suitable for grating over salad, pasta or vegetable dishes. Sophie's Select is a medium sharp cheddar and a favorite of our dog Sophie. Made in the traditional English style, each wheel is dipped in hot water and wrapped in several layers of cloth before aging for four to six months. West Virginia Blue is an assertive, deeply veined blue cheese. A little goes a long way, whether crumbled on a salad or stuffed in a hamburger grilled over wood coals with a garnish of caramelized onion. Unlike most store-bought feta, Farmhouse Feta is aged for several months, giving the cheese a distinct tang. The high butterfat content of Jersey cow milk provides Farmhouse Feta with a pleasant creaminess that contrasts nicely with its saltiness. 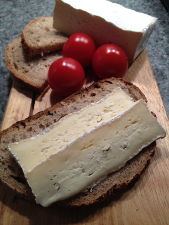 Bloomery is a semi-soft cheese with an edible bloomy rind, similar to a Camembert or Brie. Bloomery is best enjoyed at room temperature.